Roberts Radio goes red, white and blue for the Jubilee | What Hi-Fi? Feeling patriotic? 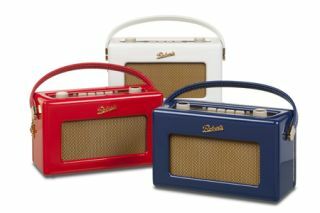 Roberts Radio is gearing up for the Queen's Diamond Jubilee with the release of its £200 Revival DAB/FM radio in glossy red, white and blue. Marking the 80th anniversary of the Roberts brand, as well as the Queen's 60 years on the throne, the special edition radios "eptomise 1950s chic". They inlude RDS station name display, a favourite station button, rotary controls and a stereo line-in socket for iPod/MP3 playback. And if you decide to take your Revival out and about, the rechargeable battery is good for a claimed 120 hours.